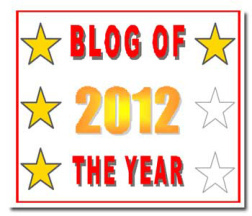 I would like to give nutsfor treasure a huge thank you for nominating Grandmother Musings for the “Blog of the Year 2012” Award. 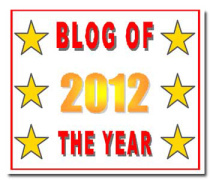 Eunice and I have been blogging buddies for a while, and I always enjoy her writings. She definitely deserves this award, and I am grateful that she felt that I deserved it, too. Please go and visit Eunice at nutsfortreasure and see for yourself what a great blog she has. 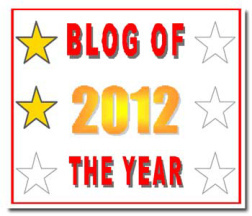 http://positivewordsmagazine.wordpress.com/ – Yellowlancer is blog out of Australia that I have followed since I began my own blog. There are always interesting prompts to start the creative juices flowing at this site. http://francineinretirement.wordpress.com/ – Francine takes the most wonderful photographs. I look forward to seeing her photos and her adventures. http://strawberryindigo.wordpress.com/- My Life in Color is a blog with a unique perspective written by a feisty lady with a great view of life. http://nmnphx.wordpress.com/- Nicole has a great feature called “Spam Comments” where she shares the weird and crazy Spam comments we are all exposed to in the blogging world. http://valentinadesigns.wordpress.com/- Valentina is a interior designs master and her great ideas make her blog so very interesting. Check out her Christmas in Colors and From Fashion to Christmas Table. http://campfireshadows.com/- Awesome stories of the Old West! I can’t wait to read the newest edition. http://greendoorhospitality.wordpress.com/ – Adventures in Everyday Entertaining. http://sharechair.wordpress.com/- Want to know what the newest apps are and what to do with them? Visit sharechair for all the newest technology finds. http://russelrayphotos2.com/- Russell’s photographs of the San Diego Zoo are amazing. 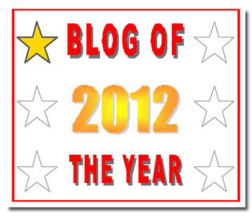 http://diannegray.wordpress.com/- Published author and all around interesting blog. 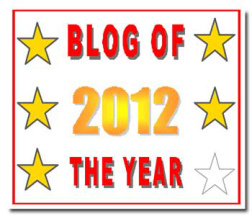 Posted in Awards and tagged award badges, awards, Blog of the Year Award, blogging, Grandmother Musings, year 2012. Bookmark the permalink. Thank you so much for the recognition! Guess what, this is the second one I’ve received and I nominated you for this award as well. 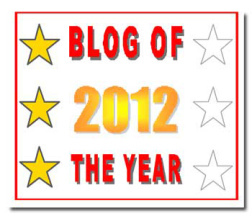 http://nmnphx.wordpress.com/2012/12/02/blogging-for-stars/ 🙂 Cheers! I am honored that you have nominated me for this award. This is my third nomination. THANK YOU! Congratulations! Well deserved. Have a great Sunday! Congratulations on your award! I don’t know all your awardees, but the ones I do are awesome, and are some of the same ones I nominated! We have great taste!!! Congrats on your well-deserved award! And thank you Jamie for the recognition! I greatly appreciate it! Hi Jamie! Congrats and thanks for the mention….I especially thank you for calling me feisty! Well done Jamie, you are amazing! Jamie, I know the rule of this award is to collect six stars and you have them all. I just want to award you one more time, because you deserve it. Thank you for being such a caring, sweet, person.